This KwaZulu Natal game lodge offers you exclusivity, luxurious accommodation, personal service and the perfect setting for the ultimate African bush experience. 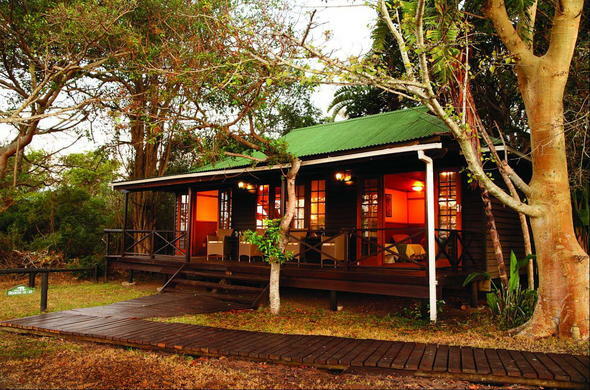 This a KwaZulu Natal game lodge offers guests exclusivity at reasonable rates, due to its small and personalised nature. Here guests can experience delicious four course meals, including succulent venison dishes, served under the stars in the boma. Accommodation at Gooderson Bushlands Game Lodge is offered in chalets connected by raised wooden walkways. These walkways lead to the spacious main dining room, bar, refreshing swimming pool and boma. Guests at this superb KwaZulu Natal game lodge are welcome to enjoy their favourite drinks around the campfire before dinner. The resident chef prepares mouth-watering meals and specialises in succulent venison and other game dishes. Game drives, day tours and transfers are available and can be arranged for you at this KwaZulu Natal game lodge. These tours include everything from viewing the Big Five to experiencing Zulu culture at the nearby Dumazulu traditional village.